The Baker Hughes U.S. rig count was up six this week to 1,809. Oil rigs were up 14 to 1,487, gas rigs were down eight to 318 and miscellaneous rigs were unchanged at four. This is the lowest number of operating gas rigs since May 1993, when natural gas was trading a little above $2/MMcf on a good day. 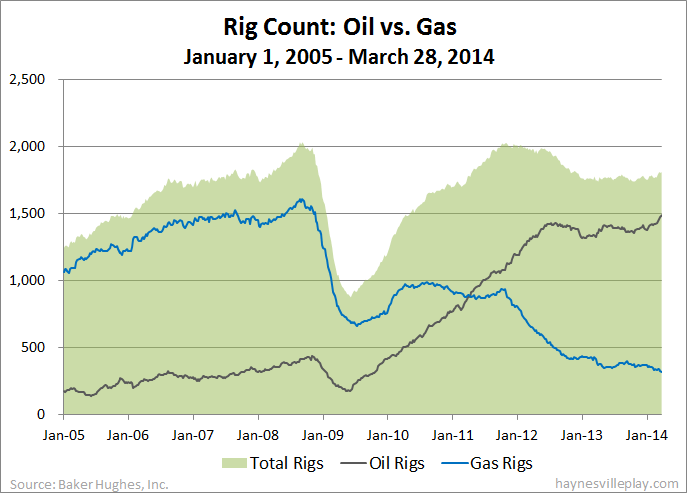 By type, horizontal rigs were up five to 1,211, directional rigs were up one to 214 and vertical rigs held at 384. Among gas rigs, horizontal rigs were down seven to 236, directoinal rigs were up one to 51 and vertical rigs were down two to 31.